French National Front party head Marine Le Pen expresses surprise after UK Independence Party leader snubs her over anti-Semitism. French far-right leader Marine Le Pen accused Nigel Farage of double standards Tuesday over the British eurosceptic leader's refusal to ally with her National Front (FN) party in the European Parliament. Farage, the leader of the UK Independence Party (UKIP), ruled out an alliance with the FN last week, saying the French party was too tainted by anti-Semitism - a reference to the convictions for hate-speech and Holocaust denial of its founder, Jean-Marie Le Pen, the current leader's father. 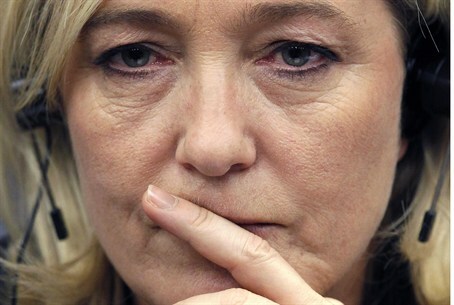 Marine Le Pen has worked hard to rid the FN of that image and she said Tuesday she was bemused by Farage's decision that any UKIP MPs elected to the European Parliament next month would ally instead with another anti-EU French group, Debout la Republique (Stand Up The Republic), led by Nicolas Dupont-Aignan. "I have tried very hard to understand what has pushed him (Farage) into these completely new statements, because, in the past, he was rather courteous towards us," Le Pen said. "Dupont-Aignan, I would remind you, has just welcomed into his group Gilles Bourdouleix, whose one claim to fame is having said that Hitler did not kill enough gypsies," she added. Bourdouleix is currently awaiting judgement after being prosecuted for a remark along those lines which he made in July 2013. Prosecutors have requested a fine of up to 5,000 euros. Both Le Pen and Farage's parties are riding high in the polls heading into the European election campaign. Latest opinion polls put the FN neck and neck with the mainstream centre-right opposition, the Union for a Popular Movement (UMP) of former president Nicolas Sarkozy, in the battle to emerge from the vote as the best-supported party in France. Le Pen recently hit headlines after she stated that her party would not allow non-pork options to be offered at schools in regions under their control, in a move seen as targeting the country's Muslim and Jewish communities.